Basically a lot of Skyward Sword for me this past week. I’ve made it to the third temple and I think a lot of stuff is about to go down. Link is chasing after Zelda who is performing some sort of ritual that I’m not totally privy to. The temples aren’t the only challenge, getting there is too. There’s a lot of enemies and puzzles that stand in Link’s way, and they’ve done a good job of keeping me occupied and entertained. My friend and I also made progress in Juggernaut, but we still have a few more hours until we’ve completed it. Juggernaut features some of the dullest gameplay, but what’s kept my friend and I going is the fun of working together and figuring stuff out. That and some of the most surreal storylines outside of a Suda51 game. 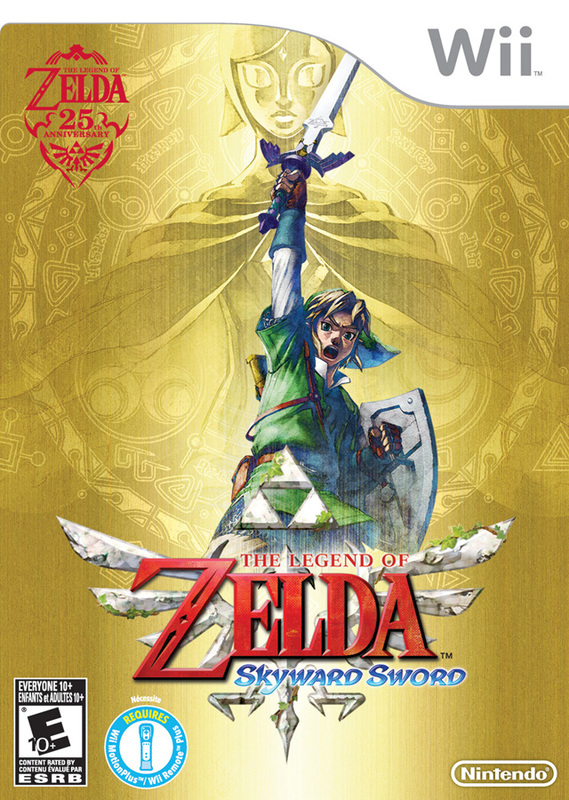 As is tradition, Skyward Sword features gold on it's box. The Legend of Zelda is probably my favorite video game series. Nearly every game in the series has a blend of exploration, combat, and puzzles that I find fulfilling. I’ve played nearly every game bearing the name so it shouldn’t come as a surprise that when the newest, Skyward Sword, was released this Sunday, I was at my local GameStop as soon as they opened. I’ve played it for nearly eight hours and wanted to write about what I’ve done so far. This time around Link is a knight in training at an academy. Rather than a princess, Zelda is a fellow student who admires Link. They live in Skyloft, which happens to rest on a floating island, in the sky. Skyloft is home to many people and there is a bazaar with a handful of shops. 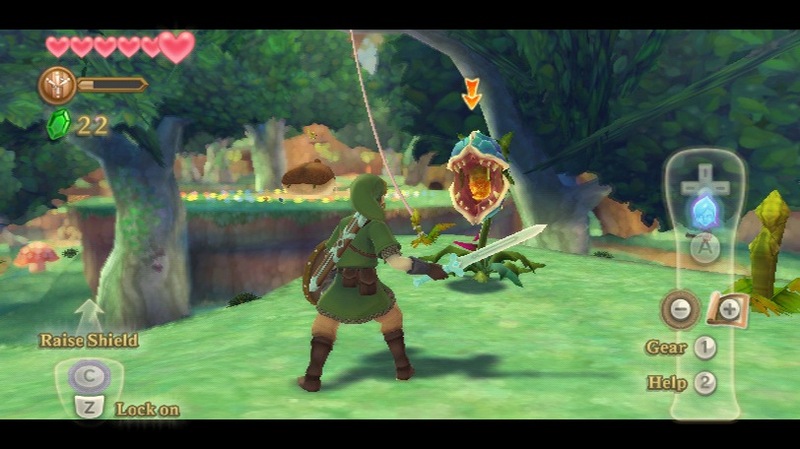 There are other floating islands as well and traveling to them on Link’s bird reminds me of sailing in The Wind Waker. For the first hour and a half I learned about the world around Link and took part in the Wing Ceremony, a contest proving one’s ability as a knight. Soon after this, Link learns that he and Zelda are destined for great things. While celebrating Link’s victory, Zelda was wrapped up in a tornado and fell to the surface. I heard many rumors of the surface as no one seemed to know what was down there. With some aid from an ancient goddess that everyone worships, Link headed to the surface. Judging by this enemy's mouth, a horizontal slice should take him out. I’ve completed one temple so far and I’m at the entrance to the second. To get to the first temple I had to navigate Link through some woods which were full of enemies, and a few helpful creatures called Kikwis. There’s one aspect of the art style that really shines in colorful locations like the woods and it’s the way scenery looks from a distance. The game looks cartoony, although it’s not cel-shaded. I’ve heard others describe it as painterly and I agree. When looking at something that’s far away, objects begin to blend together and look like a blotchy watercolor painting; it’s really cool to see. The first puzzle in the first temple stumped me for a good while. It revolved around using Link’s sword in a specific way that’s only possible with motion controls, which play a large part in the game. Skyward Sword utilizes Wii MotionPlus which makes the motion controls more accurate than would be with a normal Wiimote. Nearly every enemy I’ve run into has required me to attack them in a specific way. The combat is a lot tougher than it’s ever been before, but it’s also more fun because each enemy is a puzzle and requires me to act as though I’m swinging a sword. What I’ve had the most fun doing so far is completing side quests and exploring. As soon as the opportunity arose, I began flying to other islands and meeting new people. I’ve met many other people besides those on Skyloft and opened up a minigame and some sidequests so far. After completing the first temple, I was able to complete some sidequests back on Skyloft and received some rewards. I’ve been finding treasures like crazy and I’ve bought a lot of upgrades, aiding me greatly. There are some... colorful characters in the game. One thing that bugs me about Skyward Sword so far is the controls for falling. I’ve had to fall for long distances many times now and I can’t quite get the hang of the controls. 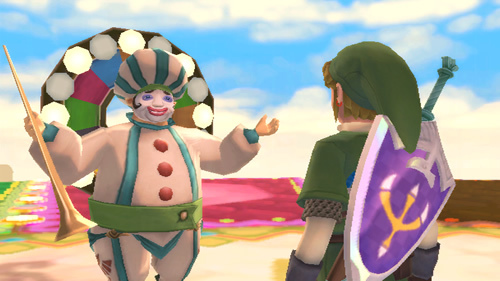 Other than that minor complaint I’m enjoying Skyward Sword. I really like the less realistic art style, I’m having fun fighting enemies and solving puzzles with the motion controls, I’m digging the exploration and rewards, and I’m just glad to play another Zelda game.